The world’s smallest* 13-inch 2-in-1 with InfinityEdge display for virtually borderless viewing and gorgeous detail with the latest 8th gen Intel® processors and optional UltraSharp QHD+. Choose Premium Support Plus with SupportAssist technology for Dell’s ultimate support experience. * Predictive technology identifies and begins resolving issues before you even know there’s a problem. It’s exclusive to Dell. By selecting any Accidental Damage term below, you agree that you are 18 years of age or older and have read and agree to the terms and conditions including the key features, which include details of the cover, relevant exclusions (e.g the cover is limited to 1 claim per year of cover), the process for claims and cancellation policy. Prices shown include insurance premium tax (at the applicable rate). The Insurance is underwritten by American International Group UK Ltd, registered office, The AIG Building, 58 Fenchurch Street, London, EC3M 4AB, United Kingdom (AIG UK). AIG UK is authorized by the Prudential Regulation Authority and regulated by the Financial Conduct Authority and Prudential Regulation Authority (FRN number 781109). You can check this by visiting https://register.fca.org.uk. New Office 2019 gives you options: you can either buy Office Home and Business 2019 or Office Professional 2019 preloaded on your system. Dell Premier Slim Backpack 15 - PE1520PS - Fits most laptops up to 15"
Dell monitors fit your needs and budget, offering productive ways to work, proven reliability, and advanced monitor technologies. All Dell monitors include a 3 year Advance Exchange Warranty, and the Premium Panel Guarantee is added on UltraSharp and P-Series monitors. Dell Pro Backpack 15 - PO1520P - Fits most laptops up to 15"
Dell Pro Briefcase 15 - PO1520C - Fits most laptops up to 15"
Dell Premier Backpack 15 - PE1520P - Fits most laptops up to 15"
Get it now for as low as £241.57 over 12 months with 0% interest. Stunning view and clarity: Fall in love with the stunning UltraSharp QHD+ resolution (3200x1800) for truly astonishing detail with 5.7 million pixels (276 ppi). Enjoy 2.5 million more pixels than FHD, so images and text are incredibly crisp. Say goodbye to blurry lines, and get pinpoint accuracy when editing images. Zoom in for advanced detail or see more content on your screen. Amazing performance and responsiveness: Up to 8th Gen Intel® Core™ i5 and i7 processors provide improved performance at lower power for amazing system responsiveness. Dynamic power mode: Engineered by Dell, Dynamic Power Mode delivers extra processing power in short bursts when you need it, squeezing every drop of power out of the CPU, while intelligently monitoring and managing system temperatures. Work or play all day: You'll experience long battery life when you are on the go—up to 14 hours, 16 minutes* on a Full HD model when using productivity applications like Word or Excel. The precision touch pad prevents jumping and floating cursors, while Accidental Activation Prevention puts a stop to unintentional clicks when your palm hits the touch pad. A standard backlit keyboard illuminates your keys so you can stay productive in low-light or no-light rooms. 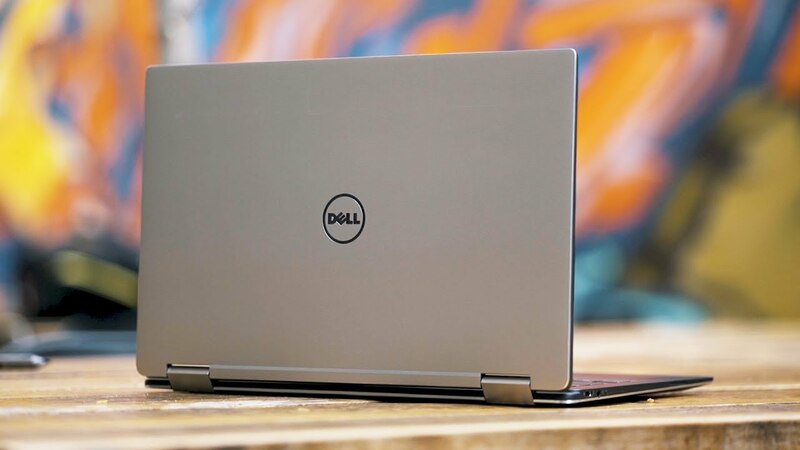 The XPS 13 2-in-1 includes 2 USB Type C ports for smart charging and display functionality and one-cable docking option that won't take up valuable desk space. Thunderbolt 3™ is enabled for one port for 8x faster downloads. A USB-C to USB-A adapter comes included. Smarter materials: Free of materials like cadmium, mercury and some phthalates, it's also EPEAT® Gold registered* and BFR/PVC-free*. Enhance the mobility of your XPS 13 2-in-1 with accessories that can help you stay connected, protected, and powered up on the go. Connect your XPS 13 2-in-1 to multiple devices – projectors, TVs, displays, and Ethernet – with one compact adapter. Protect your XPS 13 2-in-1 on the go with a sleek, custom-fitted sleeve with built-in pen holder for the optional Dell Active Pen. Maximize the performance of your XPS 13 2-in-1 with the ultimate work accessories that can help you increase your productivity in the office. Interact effortlessly with your XPS 13 2-in-1 using an active pen designed for drawing, writing, and note taking. Connect your XPS 13 2-in-1 to a single data and power source to allow for the ultimate display performance - up to three Full HD displays or two 4K displays – and faster data transfers. Expand your view and optimize your workspace with the world's first 27” InfinityEdge Monitor with ultra-thin bezels on all four sides and a fully-adjustable arm. Dell’s ultimate support experience* from Premium Support Plus means new levels of performance from your PC. Automated system health scans and virus protection make your PC runs faster, cleaner, and more efficiently. From free delivery to expert support, it's shopping, buying and owning made simple. Register and be the first to know about our new offers.